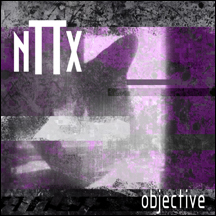 Objective is the highly anticipated new release from Toronto's EBM/synthpop hybrid nTTx. Formed in 2015 and the brainchild of Gord Clement, former singer/songwriter of Atomzero. nTTx steals elements from EBM, synthpop and industrial, and completes this sonic landscape with strong, melodic vocals that range from soft and delicate, to powerful and in your face. nTTx made his debut with the independent release of the single, "Falls Beautiful" back in May. The single contained the title track and a Depeche Mode cover as a b-side. "Falls Beautiful" was an instant hit and a quickly climbed to the top of the German Electronic Webchart (GEWC), spending 4 weeks in the top 15. The song also received critical acclaim from the press with descriptions like "master work" and "features slightly reminiscent of Nitzer Ebb or Spetsnaz mixed with groups like Depeche Mode". nTTx appeared on many 2015 year end charts across the globe, receiving accolades for song of the year and artist to watch in 2016. Objective features the worldwide hit, "Falls Beautiful," plus 3 other original songs and remixes from Caustic, Stars Crusaders and others.